A Whiff of Spice: Coconut Oil - Miracle or Debacle? Coconut Oil has been touted as a "Miracle Food" and a cure for everything from Makeup Removal to Tackling Body Odors to Improving Insulin Sensitivity. While I was convinced about the external use of coconut oil as an excellent cleanser, moisturizer and even acne controller, I had my doubts when claims were made that taking it internally, reduces cholesterol, boosts metabolism, helps in weight management and increases insulin sensitivity. I had grown up knowing Coconut Oil to be high in Saturated Fats and was considered one of the most unhealthy of cooking oils. So imagine my surprise when I came to know, that it is in fact, heart healthy. Coconut Oil is indeed high in Saturated Fats, 92% to be precise. Saturated Fats tend to raise LDL ('bad') cholesterol, but they vary in chemical structure and thus their effect on heart health. Saturated fats in Coconut Oil (like that in chocolate), have a neutral effect on blood cholesterol. Before I proceed to discuss the benefits of Coconut Oil, let me clarify. We are discussing Virgin Coconut Oil (VCO) / Unrefined Coconut Oil only, which had been extracted from fresh coconut and not the dried 'Copra'. The Refined Coconut Oil, which is primary used for cooking in India, South East Asia and other tropical countries, is extracted from the dried coconut called Copra and goes through a refining process of RBD. RBD stands for Refined, Bleached, Deodorized. The resultant oil is bland and almost odorless and stripped of Lauric Acid and other antioxidants, which is primarily the reason Coconut Oil to get its "Miracle Food" tag. Read more about various types of Coconut Oil and their benefits here. Coconut Oil has a saturated fat called Lauric Acid, a type of MCT (medium chain triglyceride). It has been shown that Lauric Acid increases HDL ('good') cholesterol in the blood and helps improve the cholesterol (LDL-HDL) ratio. That being said, it is also important to note which oil in the diet is being replaced by the Coconut Oil. If it is replacing poly-unsaturated fats dense oils like sunflower oil or grapeseed oil, it is likely to raise LDL. But if its replacing butter and lard, there will be a decrease in LDL. And yes, it does increase your HDL slightly, but does not drastically improve the LDL-HDL ratio. Coconut Oil help boost the metabolism and aids in weight management and the claim is based on the fact that it contains MCT (medium chain triglyceride). Research has shown that medium-chain triglycerides are metabolized differently than other fats. It burns more calories and hence the deduction that it boosts up your metabolism. However, we tend to forget, that like any other oil/fat, Coconut Oil is pretty high in calorie (120 per tablespoon). Give it a thought - Isn't it counterproductive to consume large quantities of calories, in hopes of losing weight! Now lets come to the most interesting part of this discussion. Coconut Oil and Diabetes. Claims are that Coconut Oil improves insulin sensitivity or combats insulin resistance in Type 2 Diabetics. Insulin resistance is the inability of cells to respond to insulin and take in glucose for energy. The pancreas tries to compensate for insulin resistance by producing even more insulin, but eventually glucose accumulates in the bloodstream. During my research, I could not find any argument refuting this claim. There were articles saying that that few lab studies have found that the fats in coconut oil may lower blood glucose levels a little. but the evidence is insufficient. There were no counter argument to deny the claim. I have read countless testimonies of diabetics and how being on Virgin Coconut Oil regimen have helped control their blood sugar. And I cannot help but trust them, for I do not see any other reason. I read about a fellow Type 1 Diabetic by the name of Rogier Donker, who documented his Blood Glucose reading for 30 day during his Virgin Coconut Oil regime and found amazing results. Honestly, I am tempted to try this out too but the idea of consuming Coconut Oil by the spoonful is totally grossing me out! Though I have my reservations about Coconut Oil being consumed orally and its effect on my already overweight self, I am truly sold about its beauty and other topical benefits. I have been using Virgin Coconut Oil topically for quite sometimes now, and I am amazed by its results. As as diabetic, I suffer from extreme dryness, red and patchy skin. The VCO had been successful in keeping my constant itching at bay, even during the winters. My cracked heels have never been so smooth. It's an excellent cleanser and moisturizer for both skin and hair. And surprisingly, its not very heavy. Growing up, I have had pretty stinky and greasy experience with coconut hair oil. I hated the smell and it made my hair all greasy and limp. But VCO is not too heavy and greasy. I have been slathering it all over my body, everyday after shower, and it has nerve stained my clothes. Or may be its because my skin is drier than a blotting paper! Virgin Coconut Oil claims to be antibacterial, anti fungal and anti viral because of abundance of Lauric Acid. "Lauric Acid is a medium chain fatty acid, which has the additional beneficial function of being formed into monolaurin in the human or animal body. Monolaurin is the antiviral, antibacterial, and antiprotozoal monoglyceride used by the human or animal to destroy lipid-coated viruses such as HIV, herpes, cytomegalovirus, influenza, various pathogenic bacteria, including listeria monocytogenes and helicobacter pylori, and protozoa such as giardia lamblia. Some studies have also shown some antimicrobial effects of the free lauric acid. Lauric acid is also prominent in the saturated fat of human breast milk, giving vital immune building properties to a child’s first stage of life. Outside of human breast milk, nature’s most abundant source of lauric acid is coconut oil." There are lot to testimonial across the internet to validate this claim. I can personally tell, that I have seen Sid's rashes (after a nasty bout of Flu) disappear within an hour of topical application of Virgin Coconut Oil. In conclusion, Virgin Coconut Oil is neither Evil personified nor an Angel reincarnated. While I'll keep on using it externally, I will have my reservation about taking it internally. 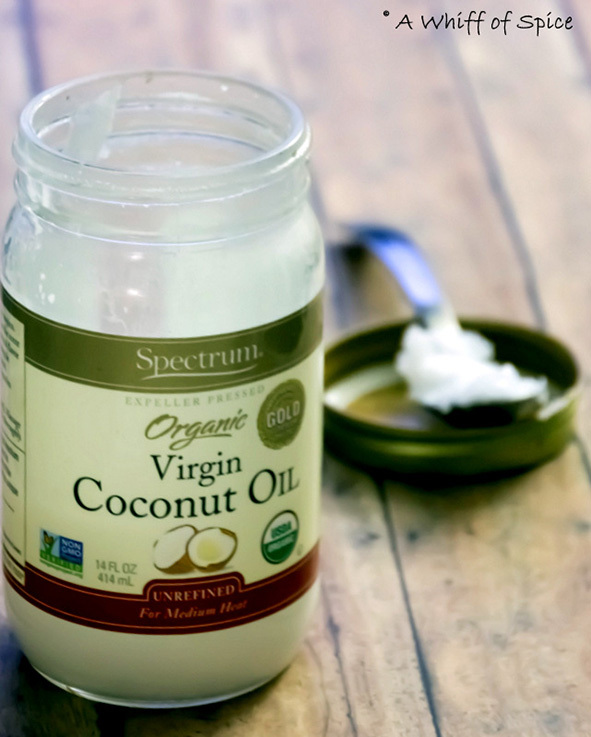 Virgin Coconut Oil has a beautiful aroma and brings a ton of flavor to cooked and baked dishes. And it is perfectly fine to cook with it as long as you enjoy the flavor and treat is like you would treat any other fat - in moderation. Virgin Coconut Oil is definitely better and healthier alternative to Butter or Margarine in baked goodies but cannot replace Olive Oil in cooking. Personally, I love using it in specific recipes, mainly involving seafood. I have tasted Zucchini Bread using Coconut Oil and found it quite interesting. Virgin Coconut Oil will be a constant fixture in my pantry but it's not going to replace my other cooking oil, viz. Olive Oil, Canola Oil and Mustard Oil! PS: I am not a certified nutritionist or a dietitian. All my research is internet based. I am just trying to make sense of this growing fad and the over information thronging the world wide web, using my logical reasoning and basic common sense. The thoughts expressed in this post/article is completely mine and I have not been compensated for my views. Very well written Progna. You have covered all the aspects. I remember the greasy coconut oil from childhood too. And if you intend to try eating it, please consult your doctor first. Absolutely! I'm not going to try anything new without asking my doc. And Thank you for your kind words. A great miracle we say to find first aid health for many health ailments. A regular uses of coconut oil supplements shows extreme health recovery from facial to hair coloring, skin care, burning woes, stitches, cracked heel etc. Hope this story portray a lot to skin care expert or chefs who liked most to bring special aroma to food and recipe. Join us if interested to boost your food junkie lifestyle SHALIMAR CHEMICAL WORKS PRIVATE LTD.